Marketing Mondays: What Is Digital Marketing? Work. It often takes over our lives. Whether you’re a business owner or part-time employee, the chances are you’ll have discussed work with a friend, relative and maybe even just to make small talk at awkward social gatherings. Wherever you go there’s always that one person who loves to talk “shop” (if you can’t think of anyone, it might be you!). They’ll tell you about the “latest” industry trends, the progression of their company and the newest systems and techniques that are making them ludicrous amounts of money. They may even have mentioned digital marketing and how it’s revolutionised their business, without fully understanding what’s actually being done by their new “hotshot” marketing expert or their partnership with the local digital agency. If you’re going to hire a digital marketing agency or employee, it’s important that you understand what digital marketing is, the different ways in which you can conduct it and how it can assist your business. By reading this article, we hope you’ll be able to get an understanding of what digital marketing is. It may even provide you with information that helps you to assist “that person” the next time they tell you about revolutionising their business. It’s tough to pin it down to a singular phrase or description. Software giant, Hubspot define it as “any form of marketing that exists online” and the Financial Times expand on this by saying that it “extends beyond internet marketing to include channels that do not require the use of the internet”. How would we describe it? Digital marketing is the promotion and advertisement of a business’s products and services on electronic devices, both online and offline. It is a broad landscape that incorporates various platforms and advertising methods aimed at boosting a business’s reach, reputation and sales figures. 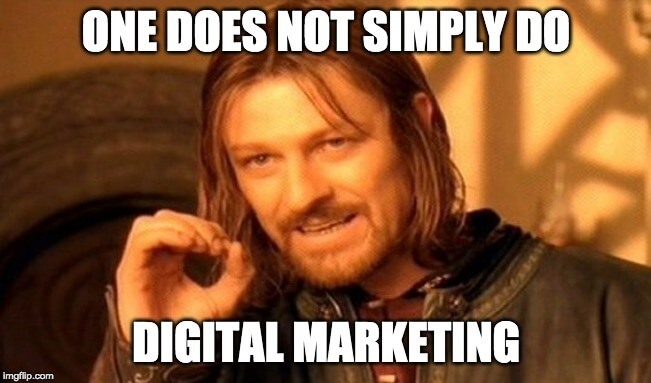 One does not simply do digital marketing… what we mean is that, digital marketing is made up from a number of advertising methods, platforms and channels. You don’t just say I’m going to do digital marketing, you pick specific parts of it, that align to your businesses objectives and time frames, and use them to form an overall marketing strategy. Search engine optimisation (SEO), pay per click (PPC) and social media marketing (SMM) are the most common methods used within digital marketing. They make use of the world’s most popular sites and search engines (such as Google, Facebook & Bing), in order to reach a larger audience. The time frames in which these methods work differs. SEO is considered a more natural, long term approach. PPC is considerably more expensive but can deliver immediate results. SMM is somewhere inbetween. Of course these aren’t the only methods used within digital marketing. Email marketing is growing in popularity, as is content marketing. So are you betting on an immediate, long term or somewhere inbetween approach to digital marketing? Why not hedge your bets? Cover yourself by going each way! In order to get the best results from your digital marketing, created an integrated strategy that includes SEO, PPC and SMM (this isn’t just Facebook…Instagram, Twitter & LinkedIn all count too!). The immediacy of PPC will help to generate fast results which gives the SEO time to catch up. Once that’s performing, you may decide to drop the PPC (to reduce direct spend) or utilise it further to move into new markets. Whether you’re posting for free or advertising on social media platforms, it’s good to have an active profile, one where you can engage with your audience in their favourite online places to “hang out”. When you learn to swim, you don’t just jump in at the deep end. It’s the same with digital marketing. To create a strategy that works, you have to do a lot of prior research. How much will each click cost you (and is that sustainable), how competitive are the SEO terms you’d like to optimise for (could you compete with a major corporation) and will your target market actively engage with you on a public social space (probably not if you’re a defence lawyer!)? These are just a few factors to consider. If you are stuck and you’d like a helping hand or even just a bit of advice, please feel free to get in touch. Hopefully, that gives you some insights into what digital marketing is. The next time someone starts talking about the digital marketing “revolution”, you’ll know exactly what they’re on about, even if they don’t! Come back next monday to read the next installment in our digital marketing series: What Does Digital Marketing Include? If you don’t, you’ll end up with a serious case of fomo (fear of missing out).